Isabella Maria Susan Tod was born on May 18, 1836, in Edinburgh, Scotland. She died on December 8, 1896, in Belfast Ireland. What she did during her 60 years on earth is quite remarkable. Women in World History: A Biographical Encyclopedia relates that her biographer, Maria Luddy, observed that her life story represents the history of Irish feminism in the critical last four decades of the 19th century and was “the outstanding advocate of women’s rights during this period.” Who was Isabella Tod and why is she so important to Irish women’s history? Isabella Tod was the daughter of James Banks Tod, an Edinburgh merchant, and her mother was Maria Isabella Waddell, a native of County Monaghan, Ireland. Her mother came from a well-known Irish Presbyterian family. Isabella was home-schooled by her mother. She was encouraged to read as much as she could. Following the death of her father in the 1850s, mother and daughter moved to Belfast. Isabella never married and remained devoted to her mother until her mother’s death in 1877. Her Presbyterian upbringing is credited for many of her views on social issues and women’s rights. Her early career includes working as a journalist. She earned her living writing leaders for the Belfast newspaper, the Northern Whig. Isabella also was a contributor to the Dublin University Magazine and The Banner of Ulster. Isabella Tod believed in education for women. She advocated for girls to have access to secondary and tertiary education. Thanks to Tod’s campaigns, the Ladies’ Collegiate School Belfast was established in 1859. 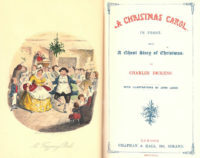 This was followed by the Queen’s Institute Dublin (1861), Alexandra College Dublin (1866), and the Belfast Ladies’ Institute, which she helped establish in 1867. Her public prominence began in 1867. Isabella Tod believed in education for women and wrote a paper titled “On advanced education for girls of the upper and middle classes” for the meeting. Over the next ten years or so, she along with other activists, including Margaret Byers, headmistress of Victoria College, with whom she developed a close friendship, lobbied and petitioned the government for reform regarding education for women. Through their efforts, the Irish University Act of 1879 made it possible for women to earn degrees and scholarships. In 1868, she was the only women invited to give evidence to the parliamentary select committee on the Married Women’s Property Bill. She continued to emphasize education opportunities for women and criticized middle-class views of it being a way for daughters to marry well and turn over management of everything, especially their property and earnings. Her platform spoke to women keeping their wages and recognition of their property rights. Isabella Tod met Josephine Butler through her work on the Women’s Property Bill. Butler was the leader of the campaign to repeal the Contagious Disease Act. The law allowed for the forcible examination for a venereal disease of women suspected of prostitution in areas with a large military presence. Tod and Anna Haslam were active in the campaign in Ireland and Britain. Tod spoke out against the double standard that allowed that “most men may be expected so to sin, and that in them it is a venial offence.” The act was suspended the same year and repealed in 1886. Tod had a lifelong interest in temperance. Her mission work through the Presbyterian church taught her that “drink is the main cause of poverty, and that yet in larger measure it is the cause of domestic discord and misery.” She joined the committee of the Belfast Women’s Temperance Association in 1874. One of the programs of the BWTA was providing meals for women working in factories. They extended their programming to include helping women prisoners. Isabella Tod was also active in the British Temperance Association and served as vice-president from 1877-1892. Her work led her to believe that women’s suffrage was imperative. She organized the North of Ireland Women’s Suffrage Committee, the first suffrage society in Ireland in 1871. After a February 1872 speech on the subject, the precursor to the Dublin Women’s Suffrage Society was born. The struggle wasn’t won until after her death, but she played a major role in women winning the right to vote in municipal elections. To show appreciation for her work, she was presented with a testimonial of £1,000 from her “English fellow workers in various philanthropies.” She was presented with a full-length portrait as a token of her appreciation for her work in Ireland in November 1886. After her death, two scholarships were instituted in her memory. The first was at Victoria College and the second for the woman achieving the highest marks at the Royal University. In March 2013 a plaque was placed on her home commemorating her life and work. Recollections designs and manufactures history-inspired garments. We hope you found this article interesting and inspiring. 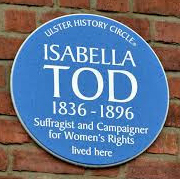 “Isabella Tod (1836-1896): Campaigner for Women’s Rights.” . Dictionary of Ulster Biography. newulsterbiography.co.uk 18 Mar. 2018 < http://www.newulsterbiography.co.uk>.